The Castlemaine locality was originally named Forest Creek where a rich alluvial goldfield was discovered in 1851. In the following year a town was surveyed and named Castlemaine after the estate of Viscount Castlemaine in Ireland. The suggested name is variously recorded as coming from Lieutenant-Governor C. J. La Trobe, or from goldfields Commissioner Wright. Both had visited or stayed at the estate. Castlemaine township includes several suburban localities: Little Bendigo, Milkmaids Flat, Norwood Hill, Wesley Hill and Winters Flat. It is situated 117 km north-west of Melbourne and 35 km south of Bendigo at the junction of the Barkers and Forest Creeks. Castlemaine was on the route followed by Surveyor-General, Major Sir Thomas Mitchell in 1836. Pastoral settlement followed ‘The Major's Line’, the wheel ruts left by Mitchell's party during the well-watered season of 1836 in Australia Felix. Three shepherds and a bullock driver discovered gold in Specimen Gully, about 5 km north-east of Castlemaine, in September 1851. Within a month the alluvial bed of Forest Creek was being worked. 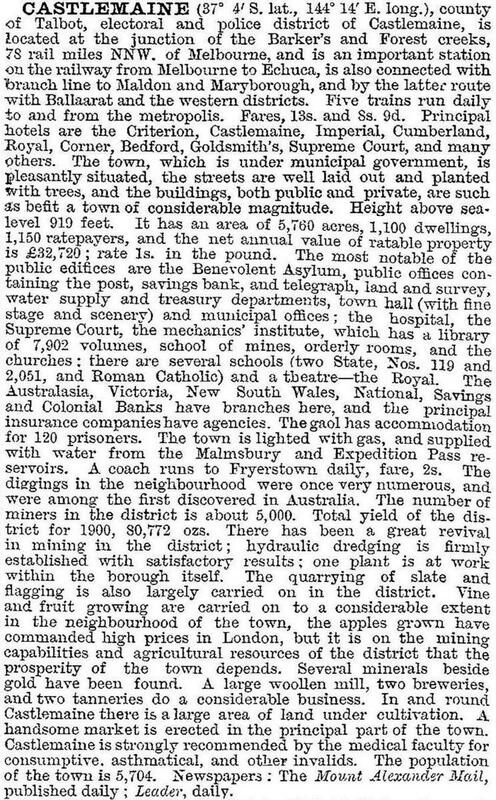 By the end of 1851 there were 8000 persons working the gold fields and several alluvial creeks around Castlemaine, and in February 1852, the newly arrived goldfields Commissioner chose an area at the junction of the two creeks for his administrative headquarters, now called ‘The Camp Reserve’. By March 1852 there were an estimated 25,000 persons on the Forest Creek diggings. In the 1970s Castlemaine undertook a significant development of its cultural and tourism assets. The first biennial Castlemaine State Festival was held in 1976, during early November, which coincides with the Spring-flowering time of several notable private gardens. On alternate years there is the open gardens festival. The 1995 Victorian Heritage Register contained 27 Castlemaine buildings, one of the foremost entries being the market (1861-62), with its finely proportioned front consisting of a portico, archway entrance and flanking cupolas.